My sweet girl, I've been longing for the day that I get to write your birth story. I wrote your brothers birth story in what seems like so long ago, and now here we are again but this time this one is for you. Even though it will be some time before you can read it, I hope when the day comes that you get to read this you will understand just how special you are to me and how wonderful your birth was. On Monday January 8th, 2017 (your due date) my wonderful midwife Elisha came over for my weekly check in. 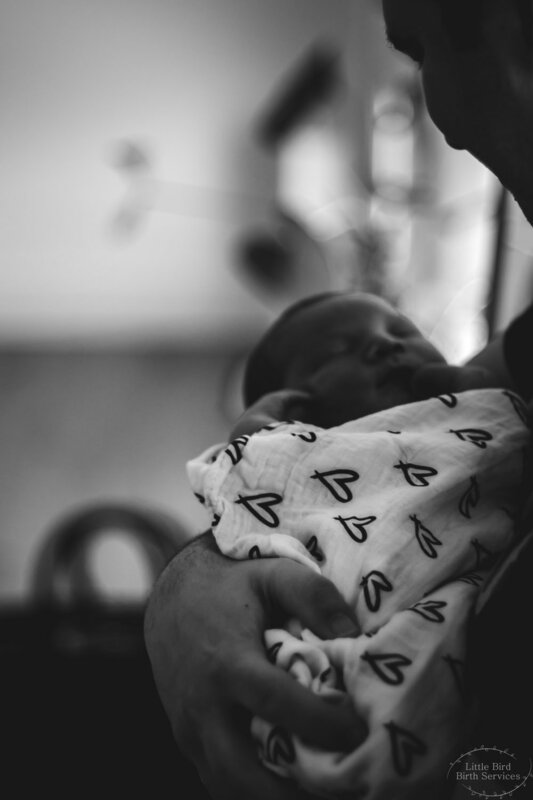 I had been having prodromal labor for what seemed like an eternity... in reality it was a week or so, but every single night I would have contractions that became regular and then dwindled off in the morning. However, on Monday morning I thought my waters were slowly leaking so Elisha came by early just to check incase we needed to start antibiotics. She checked and I was about 2cm dilated but my waters had not broken. Elisha did some acupuncture on me as we chatted and laughed about birth and completely random things. Your dad had come home from work to watch your brother while Elisha was working her magic with the acupuncture and then we came downstairs and she tells me to go climb Valentine mountain. Obviously I laughed thinking she was joking, but nope... dead serious so of course your dad and I hopped in the car, your grammy came to watch Jackson while he napped and then we made our way to Valentine mountain. It had been a long time since I'd been up there and I completely forgot how LONG the hill was before you even get to the stairs, but me being my stubborn self was determined to make it to the very top of the mountain and take a picture so I could show Elisha that yes, I climbed ALL the way to the TOP of the mountain on my due date in the pouring rain and that you'd be making your appearance soon (hopefully, anyway). We got home that afternoon and the contractions hadn't changed much since the morning. We ate dinner, got your brother to bed and then headed to bed ourselves. Your brother must have known that you were going to join us very soon because he slept through the entire night for us and both your daddy and I got a full nights rest. I remember laying in bed that night rubbing my belly thinking about how I was going to miss feeling those little punches and kicks and dances you did at night when it was just me and you laying there awake. I wondered if you'd be a little boy or a little girl and I was just so excited to finally hold you in my arms. The next morning we woke up, my contractions started to become a bit more regular around 8:30/9 in the morning so I called the midwife and she said she'd come by when they became more regular. I called her about half an hour later when they had become every 4 or so minutes apart and they definitely were beginning to get more intense. Luckily I managed to eat a yummy breakfast that daddy made and we put your brother back down for his nap just when your grammy arrived at about 10:00am. Elisha arrived somewhere between 10 and 10:30 and the contractions were manageable but definitely getting much more intense. I watched as they set up the birth pool and spent the majority of my time on the birth ball or jumping on to the couch to sway and rock through the contractions. At around 11/11:30 Elisha checked me and I was 3cm dilated. She didn't tell me this though because at this point my contractions were really intense. I was in the birth pool with your dad and brother and the water was such a relief. Your gramma, grammy, Elisha, Oceane, daddy, mommy, brother and our photographer, Rachel, were all anxiously awaiting your arrival and surrounding the room with so much love. This labor was much more intense then your brothers as I had essentially every type of pain relief I could when I was in labor with him. This time I chose to have a water birth at home with no pain medication. Your daddy was amazing, he was with me every single moment riding each wave and surge with me, squeezing my hips and rubbing my back for me, he was with me through every second of your birth and I am so thankful for his support. Elisha was incredible, each time I began to lose control she somehow brought me back to where I needed to be and helped me to find that little bit of strength that I still had left inside of me. Oceane sang a beautiful song to me while I laboured on the couch and Rachel, whilst taking our beautiful photos, offered so much support to me and helped me get grounded as well. I made my way to the bathroom to walk around after getting out of the pool at about 12:30ish and my waters broke in there. The contractions were at their peak at this point and I was so exhausted but Elisha told me I was going to get to meet you soon and to get back into the pool and knowing that you would make your way to me earth-side was the thing I kept telling myself in my head over and over to get through the remaining 40 minutes. As I began to push, my body knew exactly what to do. I found a voice within me that I had never heard before and I literally roared you out. Our poor neighbours probably had no idea what was happening as I'm sure they heard me, but it felt so good to roar and make noise and just let my body do it's thing. Elisha and I had a conversation on Monday about being noisy in labor. I had said to her "I was pretty good, I didn't make much noise with Jackson's birth" and she responded by saying to me "but why does that make it good, not making any noise?" and this stuck with me, because she's right. Why do I assume that being quiet during labor makes my birth any better than someone who made noise? Making noise and roaring/screaming/groaning is a primal urge that happens during childbirth. Holding back from this can hold you back from finding that space within ourselves to trust our body to know how to birth our babies. So many of the births I've been to each woman has been so peaceful and beautiful in labor, but making noise doesn't take away from the beauty of birth, it can enhance it and there's beauty in that. Every woman will find her way during her birth whether that be quiet and stillness, or loud and full of emotions. Regardless of how a woman births her baby, your birth taught me to trust my body and my baby and that is what I think is most important. At 1:08pm you were born into the loving hands of your daddy and midwife. You made your way earth-side fast, and my entire labor was 4 hours. The intensity of going from 3cm to 10cm in one hour is something that I cannot explain to anyone, but you were worth every single second of it. I had asked everyone to not say your gender until I held you in my arms and had checked for myself. As I held you close after you were born studying your beautiful face and hands and toes and everything about you, I decided to check what you were. To my greatest surprise, you were the little girl I had dreamed and hoped for. You are beautiful, healthy and 7lbs 11.5oz of perfection and looked just like your big brother, Jackson. We spent a few minutes in the pool as a family when Jackson joined the three of us in the pool. Those first few moments of your birth I will cherish forever. Your whole entire birth is special, but getting to hold you in my arms with your big brother and daddy beside me brings me so much joy. I always dreamed of having a daughter, Jaana and I'm so glad that you're mine. You are the most perfect addition to our little family and I cannot wait to see what the world has in store for you. Being at home and birthing you in this space so full of love was so special. I felt safe and surrounded by so much love and support while I worked to bring you earth-side. Elisha was phenomenal. I cannot say enough good things about her and the other midwives at Ten Moons Midwifery. Rachel took amazing photos of your birth and I am SO grateful that we were able to have her there with us. My beloved girl, Jaana Alexis, thank you for giving me the birth I always dreamed I could have. While it was painful and I struggled, I am proud and feel strong. You were worth every second, every breath, every single contraction and I would do it over again in a heart beat, knowing that I would get to hold you in my arms. You are such a special girl already. You have already brought so much love to our family. Your daddy, brother and I love you beyond measure, truly. I know it will be awhile before you can read this, but I just want you to know that I am so so blessed to have you as my daughter and I truly cannot wait to watch you grow into the amazing woman you are meant to be. Welcome earth-side baby girl. You are SO loved. 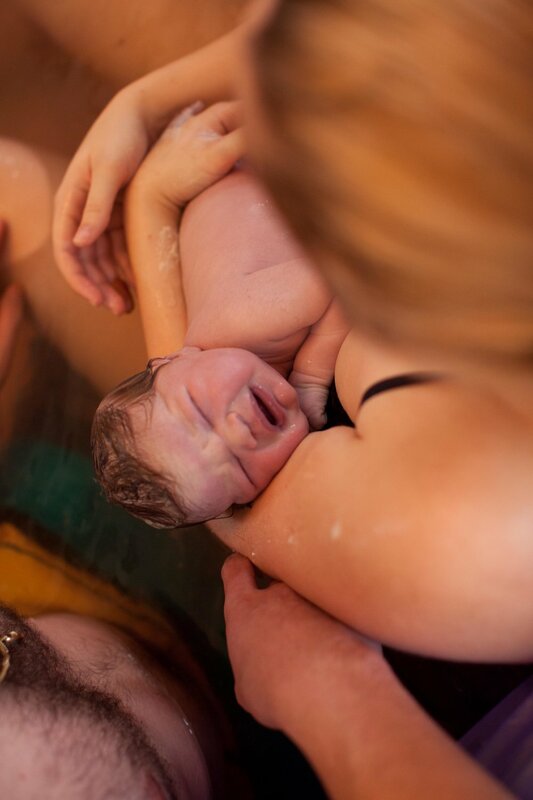 Thank you to Rachel Snyder from RS Imaging and Design for capturing these beautiful photos of Jaana's Birth. There is nothing more beautiful and empowering than witnessing a woman birth on her own terms. 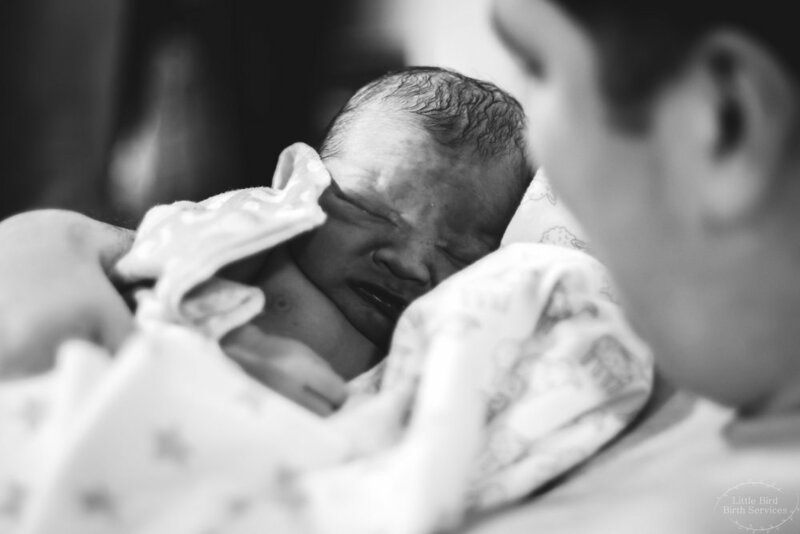 This is your birth story. On the morning of December 28th, 2017 I received a text from your mom at about 8:30am saying she was having contractions every five minutes apart and that the Midwife was on her way to the house. I gathered my gear, stopped to grab your dad a Peppermint Mocha and made my way to your birth space. Your birth would be the first home birth I would get to attend--and it was so special for my last birth of 2017. I arrived shortly after 10:00am and was warmly welcomed by your grandma at the door. Your mom and dad were on the bed working through contractions beautifully together. Your mom laid in your dads lap with each contraction and he just held her as each surge passed by. The atmosphere was so peaceful and calm, and there were so many people there who loved you. The space was dimly lit and watching your mom move and listen to her body as you made your way closer earth-side was beautiful. Once the Midwife and the second attendant arrived they began to set up the pool while I supported your mom and dad on the bed. Your mom rocked and swayed her hips as the contractions became stronger and more intense, and then she made her way into the birth pool. You could see on her face once she got into the pool some of the tension fade away. Your dad never left her side and your grandma was always close by comforting your mom. The family in the room was so supportive and when I say you could feel the love in the room, I truly mean it. Once things became more intense your mom got up and your dad joined her into the birth pool. Watching these two together was phenomenal. Regardless of the way your mom moved, your dad followed and supported her seamlessly. They truly were together as one in these moments. At 2:40pm you made your appearance earth-side. You greeted the world with your beautiful big voice after a few moments and some help from the Midwife, and your voice was music to everyones ears. Your mom worked so hard to bring you here and she was incredible. Your birth was so beautiful, Levon. It was peaceful, calm, joyful and just so relaxed. The love that surrounded you in that room was overwhelming and it was beyond incredible to see your mom give birth on her own terms, in her own space and in her own way. You were immediately placed on your mom's chest and your dad had the greatest surprise: he had been told (and kept a secret) that you were a girl at the ultrasound... but to everyones surprise you were a perfect, healthy, beautiful big boy. Being there to witness this home birth was such a joy for me. I feel so grateful for every birth I get to attend, but this birth was extra special as I am planning my own home birth as your mom and I had due dates exactly two weeks apart. Having that extra connection with your mom as she moved through her pregnancy and labor/deliver made this birth just that much more special. It's amazing being able to support women and their families, but even more so when you are both carrying life inside of you. To Casey and Drew, thank you for letting me be a part of your birth space and supporting both of you through this journey. It's been incredible getting to know both of you. You both are such down to earth people and it's so evident how much you both love and care for each other and your new bundle of love. Being there to not only support you both, but capture images of you bring life into this world has been so special to me, and I thank you both from the bottom of my heart. 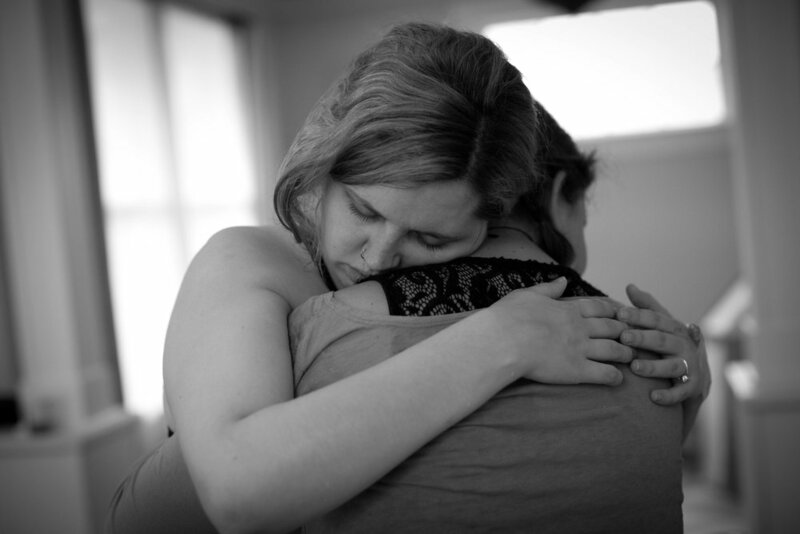 Casey, thank you for showing me your strength and how incredible a home birth truly is. Your strength, peacefulness and relaxed nature is inspiring. You are already a wonderful momma and you are surrounded by so many people who love you. Drew, the way you supported Casey during this was truly amazing. The love you have for her is so evident to everyone who watches you two and I know that your son is going to grow up with such a great role model. Levon, your world is surrounded with love. You have so many people who care for you and love you. You are going to grow up and do great things with your life. Your birth and entrance to this world was beautiful and I am so glad I was there to witness it. You are one special boy, Levon, and I can't wait to watch you grow up into the incredible person you are meant to be. Welcome earth-side Levon Andrew Austin. There is no greater delight then witnessing birth firsthand and I am so blessed to have been able to witness yours. This is your birth story, Ashton Joshua. On October 22, 2017 I watched you enter into this world in the most peaceful way. Every birth is special to me and I am grateful for every birth I've been able to attend. Yours however, will always hold a special place in my heart. I was your moms birth photographer and birth doula. We had all been eagerly awaiting your arrival and everyone was so very excited to meet you. I received a text from your mom at about 5:30pm on October 21 saying she was in the hospital as her waters began to leak. We made arrangements for me to arrive around 8:30pm and I would stay there the rest of the night with your mom and dad until you arrived. When I arrived to the maternity ward that evening I could hear the cheerful voices of your parents down the hall. I entered the room to see your momma looking radiant on the bed and your dad was sitting in a comfy chair just a few feet away. Both of them were eager to meet you--it was very apparent from the looks on their faces and energy in the room. Your momma barely flinched through her contractions, she was so amazing. Her energy was so peaceful and calm and it created the most zen atmosphere in the room. She had completely found her rhythm and it was beautiful. It was amazing to watch your mommy listen to her body and find her own rhythm as she worked through each wave so gracefully. As each contraction grew stronger your mom remained peaceful and completely focused. I've witnessed a few births now and each one never ceases to amaze me. Birth is such a normal event, yet its so beautiful and incredible to see how amazing and capable women bodies truly are. Watching your mom as she worked through each contraction, each with more intensity than the last, was inspiring. The way she rocked and swayed through each surge was beautiful. Seeing your mom and dad work together as she leaned on him for support showed just how in sync they are with each other. It was so incredibly peaceful. Your mom continued to smile even during pushing and through the most intense contractions, nothing broke her focus or her energy. You were born into this world at 1:48am on October 22, 2017. The entrance you made was stunningly beautiful. You were placed on to your mommas chest for a few minutes and then carefully weighed, examined and checked over by the doctors and nurses. You were perfect and healthy and a beautiful boy--just like your big brother. Your dad and moms eyes were so bright with joy and all you could feel in that moment was love. Witnessing your parents look into each others eyes as they held you close was an image that I will hold close to my heart forever. The love they have for each other, your brother and you is overwhelming, Ashton. 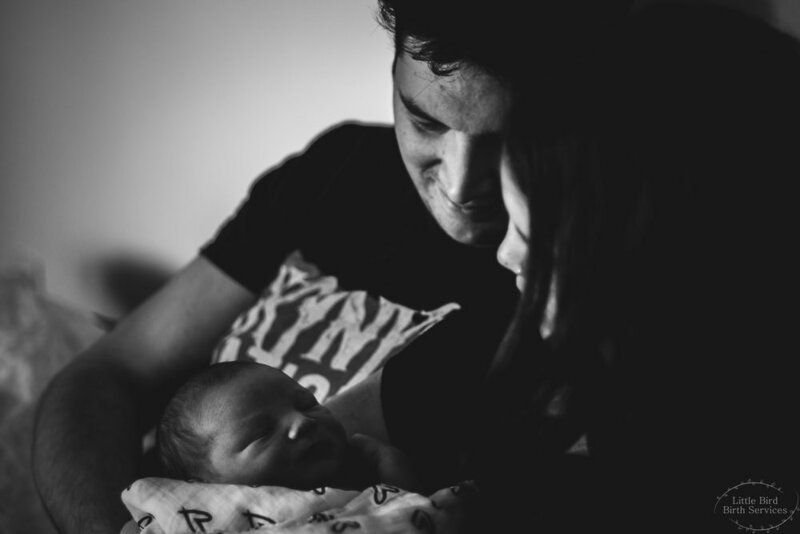 There truly is no greater joy in life than becoming a parent, and watching the two of them become parents for the second time was the most wonderful thing and I am so so grateful to have been there to capture those moments. The next day I went back to capture images of your big brother meeting you for the first time. While birth photos are especially close to my heart, fresh 48 sessions that involve siblings really truly fill me with an overwhelming sense of love. When your brother walked into the room his eyes immediately darted for you. You could see him processing and understanding that "baby brother" was finally here and he loved you so much already. You are going to grow up with a brother who will always love, teach and protect you. The joy on his face in the images shows just how proud he was and how much love he has for you. Everyone in your life loves you, Ashton. Your parents, brother, grandparents, aunts, uncles, everyone. We are so glad you are here--safe and healthy. To Courtney and Cody--thank you for letting me into this special space with you. It's amazing to see any birth happen, but when it is some of your closest friends there just that extra sense of gratefulness. Watching you both work together through this pregnancy and labor/delivery has been such an honour. To Cody, I want to send you an extra note of thanks for allowing me to be there with you both. I know at first you were unsure but the fact that you invited me in to capture these moments and be by both of your sides means so much to me, so thank you. You are an amazing father and it's evident to everyone around you how much you love Courtney and both of your children. To Courtney, we've been friends for so long and been through so much together but being alongside you for this journey is definitely the most special to me. You are truly an amazing woman. You have the biggest heart and I am so blessed to have you in my life and to have you allow me into this space with you. You are inspiring and so incredibly strong. You already are an amazing mommy and I know that those two little boys are going to grow up so very loved. Ashton, thank you for coming into this world with such a sense of peacefulness and calmness. You are already loved beyond measure and I cannot wait to watch you grow up. Welcome earth-side little one. Strength comes in many forms. Sometimes, the tiniest beings truly are the mightiest. On August 28th, 2017 I saw this truth come to life. Daxin Thomas, here is your birth story. On August 28th, 2017 at 5:30am I received a phone call from your momma--she was in the hospital in active labor. I packed my bag, got my camera organized and made my way to meet your parents. I arrived to the hospital at around 6:30am and the sun was just beginning to come up. It was going to be a beautiful hot summer day; a perfect day to be born on. I was walking into the hospital watching the sun come up thinking to myself how truly blessed I am to be able to capture life's most beautiful moment: birth. I made my way to the maternity ward and was greeted by your parents. Your momma was on the bed, calm as can be with a beautiful glow to her. Your daddy was sitting on the stool right beside your mom, excited and eagerly waiting to meet you. The room was full of calm energy and pure joy. I began to take some photos of your parents eagerly awaiting your arrival, your dad was cracking jokes all morning and at about 8:00am your moms water broke. Things were progressing and your mommy and daddy were so beyond excited to meet you. The light in the room as the sun came through was beautiful, it truly was a perfect day for you to be born. It cast a beautiful glow on both of your parents emphasizing the love they share for each other. Your momma was so beautiful in labor. She was calm, focused and worked through each contraction with grace. Aside from my main focus of the photography being your birth, I was continually drawn to your mommas "strength" tattoo on her wrist. I focused on it during her maternity photos too, and little did we know that the tattoo could not be more fitting for your birth, Daxin. At around 10:00am your momma was ready to start pushing. She was amazing and breathed through each contraction like a champion. Watching your parents work together during this time was inspiring. Your dad never left your mommas side, his hand rested on her arm, shoulders, and head continuously comforting her. They were both so amazing as they flawlessly knew what to do for each other. Your mommas strength was incredible, her epidural began to wear off and she continued to listen to her body and breathe through each contraction, knowing it meant she was closer to meeting you. She moved through each contraction finding a position that helped her through each surge...each one bringing you closer to her. You were born at 12:30pm, and you fought hard from that moment on. You were placed on your mommas chest for a few moments until you were carefully placed into the Panda warmer so the doctors and nurses could help you. I cannot comprehend the feelings your parents were experiencing at this moment. The doctors and nurses were amazing. Seeing the love every person had for you in that room was something else. While the next few minutes were unbearably scary and stressful for your mom, dad and you, you were a fighter from the start and you were ok. While it is not my story to tell on how your mom and dad experienced this birth, I can tell you from my point of view: witnessing you enter this world I saw love, strength and trust. Your birth was one of the most beautiful, incredible and inspiring births I've ever attended. I saw and captured strength in all of it's form at your birth. You are welcomed earthside into the strongest family I know, Daxin. The love that your parents, siblings and grandparents have for you is endless. It's so evident in the images I was able to capture. Every single birth is a miracle, and your birth was that and so much more. I've never asked your mom the meaning behind her "strength" tattoo. However, I can tell you from what I witnessed you have a very strong momma and daddy. Usually when we hear the word "strong" we think of something big and tough. I was humbly reminded that often real strength comes from the tiniest beings. Daxin, you are strong and you are mighty. I am so grateful that your parents allowed me into this sacred space with them to capture your birth, it was nothing short of incredible. Watching you enter this world has made me even more appreciative of the miracle of life. Birth is nothing short of a miracle and I am so blessed I was able to witness yours. To Heather and Jeff, thank you for allowing me to be your birth photographer. I feel very humbled that I was welcomed into such a precious space with you guys. Heather, you are an incredible woman and you already are an amazing momma. Jeff, you have such a kind heart--it is so evident in the love you have for Heather and your kids. You two make an amazing team, and you've both brought the most adorable little boy into this world. Be proud of what you two have accomplished. You two really encompass the meaning of love and strength. This birth will forever be in my heart. I can't thank you enough for allowing me into this space with you. Welcome earthside, Daxin Thomas. You are so incredibly loved. On Thursday, July 20th, 2017 I received a phone call from your mom, Bradina. It was 5:51AM and she was having regular contractions. I packed my bag, got organized and made my way to your house. When I arrived your big brother, Josh, was eager and excited when he answered the door. Your momma looked like a goddess while on the birth ball rocking her way through her contractions. It was 6:48AM when I arrived. Your daddy, James, came home from work at about 7:15AM. He was exhausted from a long day/night of work, but you could see the excitement in his eyes...they were sparkling. Bradina's contractions were now about 4 minutes apart, lasting for approximately 1 minute. They were getting more intense with each rush, and we decided it was time for us to make our way to the hospital once the childcare for your big brother and sister had been organized. Big sister, Gemma, woke up shortly after Daddy got home and your big brother and daddy got her ready for the day. Your momma was busy organizing socks and everyones bags to help distract herself through the contractions but they were becoming very intense, very quickly. Your momma and I hopped in my car once I called the Maternity ward, and we made our way to the hospital while your daddy and siblings went to meet the babysitter. We arrived at the hospital at about 8:15AM. Momma got checked at 8:25AM and was about 3CM dilated. Contractions were every 2-3 minutes apart. Your mom was incredible. With each breath she worked through the rush of the contraction in the most beautiful way. Bradina had the fetal monitor on for about twenty minutes to monitor you because of her previous VBAC and the closeness of the two births. You were perfectly healthy and so was mom. Your heartbeat was a comforting and entrancing sound to listen to. While working through each contraction your momma used the birth ball, went on hands/knees, rocked and swayed and had daddy and myself (her Doula and Birth Photographer) comfort her. We suggested hopping into the shower to help relax her back and uterus during the contractions and it did offer some relief. Your dad was such an amazing support to your mom. His jokes kept the air light in the room, and seeing your moms beautiful smile just lit up the room. They were such an amazing team together. Despite being tired, your dad remained your moms rock. It was such an honour for me to be able to witness, assist and offer comfort to the both of them during your birth. At about 9:56AM, the doctor arrived to check how far your mom had been progressing. She had dilated to 6CM in just over an hour. The contractions were very intense but your mom remained strong and focused the whole time. The doctor attempted to break the waters, which ended up in a little trickle of the "waters" releasing. After this happened, Bradina got out of bed after a few contractions were monitored and made her way back to the shower. The water and your daddy helped your mom work her way through these next few contractions. Once Bradina got back into the shower she was feeling a very strong urge to push. She had about 2/3 contractions all within about a minute and the doctor was called back into the room, and the nurses got your mommy back onto the bed. We all knew you were going to make your appearance earth side very soon. Despite being in a ton of pain and doing her whole labor naturally, your mom still looked like a beautiful goddess as she worked her way through each contraction. The laughing gas offered a bit of relief to momma which was great. At 10:50AM, the doctor came in and by the time she arrived in the room, you were starting to crown. The doctor gowned up and put her gloves on and she began to instruct your mom on when to push and what to do. Your daddy was right beside your mom, holding her hand the whole time and the nurses were awaiting your arrival. I was able to capture many beautiful shots of you emerging into this world that your momma and daddy will show you when you are a bit older. Your birth was beautiful, quick, intense and stunning. You were born at 10:58AM with just one push. You weighed 7LBS 7OZ and look just like your big sister, Gemma. You are perfect, Lacey Joy. Once you arrived, mommy immediately had you skin to skin. They had delayed cord clamping and daddy was able to cut the cord. The joy on his face while doing this was so heartwarming. Your mom was so strong through everything, she roared you out like a lion and it was the most spectacular thing to witness and be a part of. Your mom was a champion during the next half an hour while the doctors did some work and cleaned her up. You were skin to skin with daddy during this time and he was loving every minute of it. The nurses then weighed you and measured you and then you went right back to mommas arms and began to nurse perfectly right away. Later on in the afternoon I returned back to the hospital to take photos of your siblings meeting you for the first time. Both Joshua and Gemma are going to be amazing siblings to you. Seeing you brought the biggest smiles to both of their faces. I am so honoured and blessed to be able to have witnessed your birth, Lacey. Your moms strength will forever stay with me. The connection between your parents was amazing. What a beautiful birth to witness and to photograph for my first clients. I will always remember the amazing journey I witnessed of you coming earth-side. To Bradina, James and family. Thank you for allowing me to be your Doula and birth photographer. I can't express my gratitude enough for you choosing me to support you and comfort you during this incredibly personal and special time. Bradina, you are seriously one of the strongest women I know and you truly looked like a goddess in labor. You are incredible, Bradina. James, your support was so awesome during Bradina's labor. Watching you comfort Bradina and get to hold your baby girl in your arms was amazing. Welcome to the world, Lacey Joy. You are so very loved.